Armenia should become a country of latest technologies in the future, President Armen Sarkissian told reporters on Wednesday, after touring the CANDLE Synchrotron Research Institute. 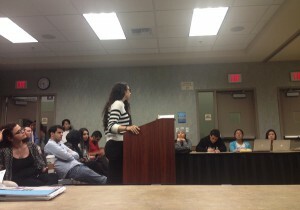 “There are several steps to develop modern technologies. First of all it is the education system. Eventually, the developers, users and sellers of latest technologies are people who have professional skills. Thus, the education system is crucial for this sphere,” Mr Sarkissian stressed. According to him, Armenia’s advantage over others should be having scientist programmers, i.e. programmers who are also highly-qualified mathematicians, physicists or chemists. “It is a fact, not arrogance, that we are more intelligent. Our goal should be to prepare highly skilled creative specialists starting from biotechnologies up to modern technologies. In this respect, this institute plays a key role,” he said. Mr Sarkissian stated that many scientific institutes established during the Soviet period have lost their importance or do not operate any longer, but CANDLE founded in 2000 continues to impress. “I am happy to be here for several reasons. First, for the fact that we have managed to create a top-level research institute internationally after 2000. Second, it is a double pleasure for me since I have a little input in establishing this institute in some sense,” the president said. Armen Sarkissian unveiled plans to develop physics in Armenia. “We will see how we can support Armenia to become a physics power, starting from biophysics up to astronomy. There is a need for that,” he said, adding the support plan will become clearer after his visit to Byurakan Observatory in the next few days. The Science Committee of Armenia’s Ministry of Education and Science Together with CANDLE Synchrotron Research Institute is organizing an open day for the citizens of Armenia, foreign guests and the mass media representatives on the 18th of July at CANDLE Institute. For the first time the research laboratories of radiophysics, laser technologies, magnetic measurements, ultrahigh vacuum technologies, diffusion welding and soldering, advanced materials and microdevices, experimental biology will be open for a large audience. The guests will be presented the AREAL electron accelerator which gives new opportunities to carry out advanced researches in the fields of physics, biology, medicine, materials science, chemistry and other scientific fields. A Turkish MP has claimed that Islamic State terrorists in Syria received all the necessary materials to produce deadly sarin gas via Turkey. The MP Eren Erdem says that the Syrian Government did not have sarin gas and insists there are grounds to believe a cover up has taken place. Erdem, from the Republican People’s Party (CHP), made the claims in parliament, citing evidence from an abruptly-closed criminal case. He argues that the West purposely blamed Syrian President Assad for the August 2013 sarin attacks, using it as part of the pretext to make US military intervention in Syria possible. “About the shipment, Republic prosecutor of Adana, Mehmet Arıkan, made an operation and the related people were detained. But as far as I understand he was not an influential person in bureaucracy. A week after, another public prosecutor was assigned, took over the indictment and all the detainees were released. And they left Turkey crossing the Syrian border,” he said. “The phone recordings in the indictment showed all the details from how the shipment was going to be made to how it was prepared, from the content of the labs to the source of the materials. Which trucks were going to be used, all dates etc. From A to Z, everything was discussed and recorded. Despite all of this evidence, the suspects were released,” he said. Speaking to RT, Erdem said that according to some evidence Turkish Mechanical and Chemical Industry Corporation was also involved, with some unconfirmed reports pointing in the direction of a government cover up, with Minister of Justice Bekir Bozdag’s involvement. Certain evidence suggests Bozdag wanted to know beforehand from the sarin gas producer when and if the Islamists will use the chemical weapon. “When I read the indictment, I saw clearly that these people have relationships with The Machinery and Chemical Industry Institution of Turkey and they don’t have any worries about crossing the border. For example in Hayyam Kasap’s phone records, you hear him saying sarin gas many times, saying that the ateliers are ready for production, materials are waiting in trucks which were supposedly carrying club soda,” he told RT. The parliamentarian said that now he feels like there is a witch hunt against him, after he confronted the justice minister. Bozdag, according to Erdem denied only the part that he wanted to get notified about the operations beforehand. Furthermore, Erdem argues that the West purposely blamed the regime of Bashar Assad for the August 2013 attacks and used it as part of the pretext to make US military intervention in Syria possible. The MP said that evidence in Adana’s case, according to his judgment, proves that IS was responsible. we’ve found the evidence. We know who used the sarin gas, and our government knows it too,” he said. “All basic materials are purchased from Europe. Western institutions should question themselves about these relations. Western sources know very well who carried out the sarin gas attack in Syria. They know these people, they know who these people are working with, they know that these people are working for Al-Qaeda. I think is Westerns are hypocrats about the situation,” he concluded. The Exodus from Turkey, Turks packing their bags looking elsewhere in the world. With tens of thousands of officials, academics and teachers being suspended or arrested in Turkey, more and more people are starting to fear for their futures. In particular young and well educated Turks are leaving the country. Islamic State (Isis) has launched an attack on the Syrian border town of Kobani from Turkey for the first time, a Kurdish official and activists said. The assault began with a suicide attack by a bomber in an armoured vehicle on the border crossing between Kobani and Turkey, the Syrian Observatory for Human Rights (SOHR), a UK-based opposition group, said. Nawaf Khalil, a spokesman for Syria’s Kurdish Democratic Union party, said that Isis “used to attack the town from three sides” but “today, they are attacking from four sides”. Turkey has previously backing the Syrian rebels fighting to topple the country’s president, Bashar al-Assad, has it has been reluctant to help the Kurds in Kobani for fear of stoking Kurdish ambitions for an independent state. There was no comment from Ankara on Saturday about Isis fighters launching the assault from Turkish soil. SOHR said heavy fighting also took place south-west of the town, where Isis brought in tanks to reinforce their fighters. 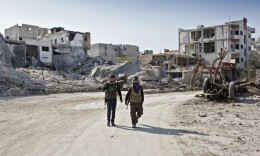 The group began its Kobani offensive in mid-September, capturing parts of the town and dozens of nearby villages. The town later became the focus of air strikes by the US-led coalition against the militants. SOHR said on Saturday that the latest fighting killed at least eight Kurdish fighters and 17 jihadists. The videos allegedly showing the Nagorno-Karabakh helicopter downing, released by Azerbaijan several hours after the incident, were filmed during the Syrian war, media expert Samvel Martirosyan told reporters on Saturday. According to him, after the incident, Azerbaijan started to disseminate video recordings to show that allegedly there have been military operations. Two videos were released, which actually were from the Syrian war, Mr Martirosyan noted. 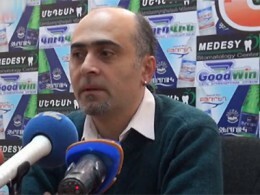 The media expert praised the Armenian media for their coverage of the recent events. ‘Why I moved from Turkey’ “our country is now a fully corrupted country” incurable situation! Blogger Melih Karakelle has written a piece to inform his friends and relatives why he left Turkey. 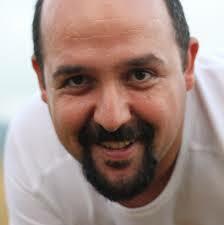 His blog, www.melihkarakelle.com, is usually visited by 500 people a month. But his latest piece hit 100,000 in the first 24 hours. Karakelle is a mechanical engineer who decided to leave his family and friends behind and settle in Britain. This is a shortened version in a loose translation. He starts with a lexicon of terms for the piece: An ignorant person is not a person who has been schooled less, they are someone who has not been educated to suit the norms of society, who poses a threat to daily life. For example, while everybody is queuing, they cut in line, thinking they’re being clever. A driver who has not grasped that he needs to stop for pedestrians at a crosswalk is ignorant, regardless of his degrees. Stupid: Statistically, one in every three people in society is stupid. It is the answer to “Why do they do this?” in many situations. There is a critical threshold in societies to prevent ignorance, Karakelle wrote: This threshold can be defined as the number of ignorant people per one person of reason. The state is responsible for educating the ignorant and the stupid to a level where they do not harm the rest. The best example of this is when a Turk goes abroad and comes back, saying: “Dude, everybody gets in line there. Nobody violates anyone else’s rights. You step into the crosswalk and all the cars stop. “Well, the state has primarily educated all its citizens to a level where they would not harm society. As a result of this, the fact that the other person is stupid does not constitute a problem for you. Thus, fewer cons grow up in civilized societies; more scientists emerge from there. “Why did I move from Turkey? Well, although it has multiplied in the past 12 years or so, as a result of a decaying period of the last 30 years which started with [late President Turgut] Özal, our country is now a fully corrupted country. If in a country the number of those who think stealing is a bad thing is under 50 percent, then you cannot count on these people to build values and long-term plans. Karakelle says several examples of this exist in recent history. He asks us to take a look at the Afghanistan, Iran, Lebanon and Egypt of the 1960s. And take a look at them today. Turkey was slow in corruption, the blogger believes. This may be due to Atatürk or may be because of its proximity to Europe. But, time for Turkey has also expired. “Now, for the time being, we have transformed into a society where an average of 12 hours are spent in front of the TV watching soap operas, a society with people who show no respect to anyone else but themselves, one that honors and even hands over the governing of the country to bullying. “And this society is raising their kids. These kids will shape the behavior of your own kids also, no matter what you do … They will live at least 70 years together in the same society. At this point, there is nothing to be done; trying to do something is a waste of energy.